Think Outside – Page 3 – CREATING. DISCOVERING. CHANGING. We became debt free in December of 2015. We haven’t looked back since. Brandon and I have started a plumbing company this year with $0 business debt and recently paid cash for his first work van. It hasn’t been easy because the debt leverage option is always there. You can use debt now and build your capital, pay 0% if you pay off your credit card every month, and EVERYBODY has a car payment. For us being debt free is more than just a goal we achieved, it’s a way of life. Since becoming debt free our stress level has decreased, our marriage has improved, and our lifestyle has changed! We are now doing things we’ve always wanted to do. It has been an adjustment. We aren’t used to being able to give big amounts, or plan vacations, have hobbies, etc. So we are having to practice giving ourselves permission to do things. I call it “Post Debt Stress Disorder“. You have had to say no to everything for a long period of time, & now you can start saying yes (within budget of course). Now that we have been debt free for a while now, I see it so clearly! Now that adventurous girl the was trapped beneath all of the debt, is FREE! I am a better mom, better employee, better spouse, and a happier person. Seeing my husband thrive in his own business knowing he is stress free, setting his own hours, working for himself, and growing more and more is truly rewarding as a wife. He loves me enough to keep that adventurous girl alive by not going into debt for his business. I am forever grateful to him for that! He encourages the crazy chick, that wants to travel the country, climb the mountains, & walk in the wilderness. It’s the greatest time in our lives knowing that all of that pain and struggle we went through has given us the greatest reward! When God called us to become debt free, we knew it would be difficult. We didn’t know how difficult until we started saying no to things we REALLY wanted to say YES to. We wanted to give up several times, and let other people’s opinion dictate how we lived our lives, but when God calls you, you listen. When we obey the Lord his rewards have been more than we could ever imagine. The freedom he has given us is beyond any words I have to describe this feeling. The dreams we are dreaming today are bigger and better. The adventures I’ve always wanted to go on, are no longer just in my dreams, they are coming true everyday! We are excited to be on this adventure, and even more excited that we get to document every moment. STAY TUNED! I’m sorry. You will be 5 next month and I spent the first 4 years of your life getting it wrong! 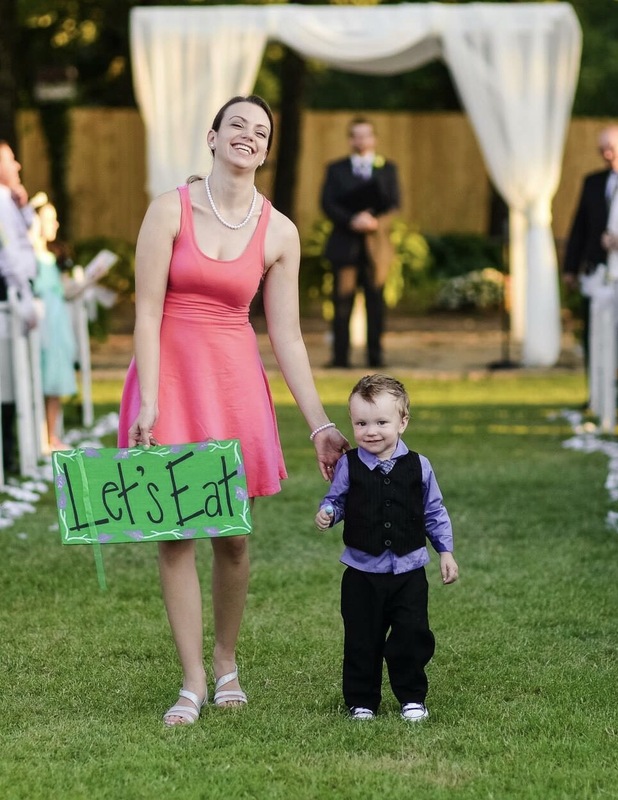 This is my promise to you & I may not always get it right (I’m not perfect), but I hope one day you will look back on our time as Mother and Son and smile. You were given to me on a June 8th, 2012 & you literally took my breath away. As a new mom I failed as most new moms do. I had postpartum depression, and was sad a lot when you were little. I was fixated on the littlest things that I now know don’t matter. I was always guilty for leaving you to go to school, and was constantly stressed when I was with you. It wasn’t easy and my anxiety caused from high expectations of myself took away from enjoying you to the fullest. I did enjoy you as a baby, but not as much as I could have. For that I am sorry. You will be 5 in one month, and I am happy to tell you that I QUIT! I quit letting my “perfection” take away from presence. Life is short and I promise to make the quality of our time together greater than the quantity. You see, I spent the first 4 years of your life spending the majority of our time together, but it wasn’t quality! I can spend 16 hours a day with you, but if I’m sad and stressed, you deserve better. So that’s a birthday promise to you from me. I promise to focus more on the quality of our time not quantity. I promise to laugh more, and laugh loudly! I promise to put my distractions away and make sure you know I’m listening to your crazy adventures! I promise to not stress about you making good grades, but focus more on you being a good person. I promise to read you stories. I promise to let your dad take me on dates so you can see how to treat your future bride. I promise to be brave so you can be courageous one day. I promise that I will do things I love so I can be a better mom to you. I promise to take you on the greatest adventures you have in mind! Above all, I promise to only look at the past happy I was fully present, and not wish I could back and do it differently. We are going to have one heck of a ride. Buckle up! 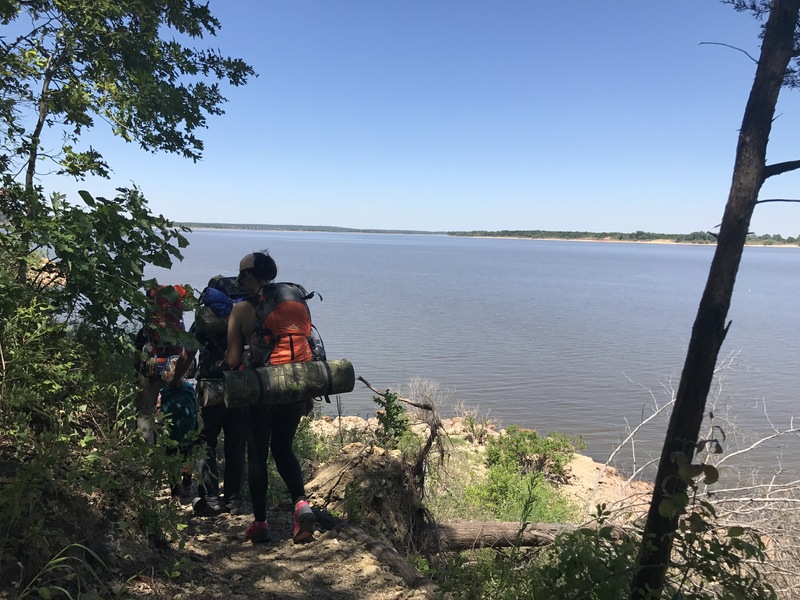 ​We just got back from our amazing trip at Cross Timbers Hiking Trail. Our full wrap up blog post including a detailed review of our experience coming soon! For now click the link below for a full video of our trip! Throughout the course of your life you will experience different types of adventures. It doesn’t always look like skydiving in New Zealand, or Backpacking across the Appalachian Trail. It can look like dressing the kids for school and still making it there on time, or going on a picnic in your backyard because you don’t want to set the table. According to Matt Walker there are a few different elements/key components that make up an adventure. It can look and feel differently but if you have these 5 things you’re on an adventure of a lifetime! High Endeavor – This is something that requires a lot of our energy and time. It challenges us to be at our best. Uncertain Outcome – In reasonable amounts this is necessary for any adventure. Keeps you engaged in what your doing without having 100 percent control of the finish. Commitment- Being committed is essential in any adventure. Willing to work through difficult times, pushing through, and finishing makes for a successful adventure. Tolerance for Adversity- this requires you to continue on when things don’t go as planned. Being able to adjust is crucial on any adventure! Companionship- We can’t do life alone! The bond created through doing something difficult with others is important. Everybody is on their own adventure, the important thing is to recognize every element shapes and changes us. Don’t be afraid of your adventure, embrace and enjoy it! You only get one. It was 1996. I was 8 years old, and I remember like it was yesterday. It was a stormy Saturday afternoon & we piled in my dads truck & raced to the Yukon movies! It was the movie that brought more attention to Oklahoma than the oil boom in the early 80’s. TWISTER. I was known as a dare devil growing up. The first rollercoaster I ever rode was the Shockwave at six flags over Texas. I was 4 years old and stood on my tippy toes to prove to my older brother I could ride after he dared me. As the train pulled away from the station and clicked to the top I freaked! All of the sudden I didn’t want to go, but it was to late. I had to ride this double loop giant rollercoaster all because my brother dared me to. I passed out and had to be carried off the rollercoaster. I loved every second if it. From that moment on nothing could stop me from adventure! I was fearless, but that didn’t come natural to me. As a baby I would collapse to the floor anytime a plane would fly over our house or a clap of thunder would hit. It stopped me in my tracks no matter what I was doing. If it weren’t for my brother daring me to ride that rollercoaster, my life would look a lot different. May 11th 1996 was the day my spirit was awakened & my mind was blown. The movie TWISTER was a story of a group of storm chasers from OU who were on a mission to advance the science of studying tornados. Joe, played by Helen Hunt, was my personal hero. She was beautiful, smart, strong, courageous, and unlike any other female character I had seen in the movies. She chased tornados with boys, & was the boss. How freaking cool is that?! That same dare devil that my brother brought out at age 4, evolved again at age 8. I live in Oklahoma where the greatest weather in the world takes place! I realized through watching the movie and living that day at six flags in my head, I could be anything I wanted to be. I was hooked! I started to read every book about tornados, watch all the documentaries, and stay outside all day just looking at the sky. The sound of thunder in the distance and flashes of lightening against the clouds sends my adrenaline into overdrive. Jumping in my daddy’s ford and flying down highway 81 in Canadian county with Gary England’s voice over the radio was my first big adventure! It’s the adventure that is still alive today. Still living in Oklahoma today, I always get excited when the sirens go off. It’s the fear, excitement, and the pure rush of knowing you can see something you may never see again! Today I spend the majority of the spring and summer months studying radars, and looking at prediction models. I always love to predict high risk areas and Tornado Warnings. It’s a lot of fun when my chaser buddies go out and send me messages asking where they should set up. Although I love to storm chase, I try to do it as safely as I can. I try to only go where I know the road systems and have good visuals and cell service. Seeing a Tornado rush through the open plains is pure magic. Every tornado is unique and has its own spirit. Some are quiet and peaceful, dancing in a field against a Oklahoma sunset. Others are violent and destructive, taking peoples homes and lives away. Every storm presents its aftermath and Oklahomans know how to take care of one another. We know how to neighbor here in the heartland. I believe I will always love Storm Chasing. It’s helped me become a brave woman, wife, and mother! I fear Oklahoma weather, but I am not afraid of it. Being an adult has forced me to become responsible and less of a FREE SPIRIT, however the reckless daredevil still lives deep within my soul. I will always choose to live life as if I am storm chasing. I may not know where it will take me, but I will follow the gravel roads and enjoy the ride. This is hard to write. It’s not something I ever thought I would be talking about on this blog, but after reading the book and now watching the popular Netflix series, I feel as if not writing about it would be a mistake. 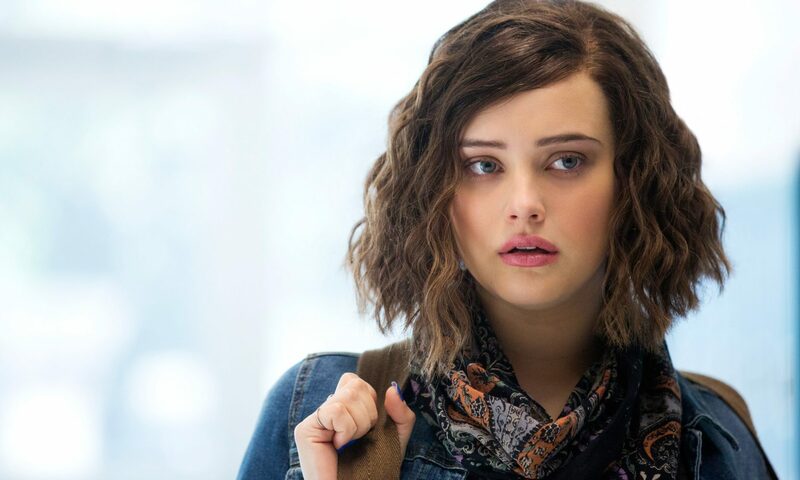 In this story Hannah Baker leaves behind 13 reasons her life ended on cassette tapes. I must admit with all the controversy surrounding this show I was hesitant to watch. I’m glad I watched it. It wasn’t easy, and sometimes I had to look away. The images and scenes were portrayed in such a real way that I physically and emotionally hurt. Well done writers, directors and actors for getting it right. The book was hard to read and my imagination didn’t bring the scenes to life as much as the Netflix series did. The pain felt while watching it couldn’t even come close to the pain of actually going through it, and I don’t want to lessen the torture of suicidal thoughts. It’s not a cry for attention, being overly dramatic, and only for the weak. It’s very real and something you should never turn away or take lightly. Here is my take away from watching this life changing series. No matter how many reasons you have to end your life, it only takes 1 reason to live it. 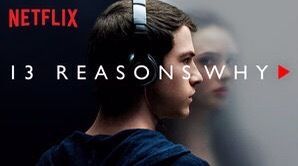 If you find your 1 reason, you have the one thing Hannah Baker didn’t. HOPE. The smallest ounce of HOPE will make the 13 giants you face seem smaller, and give you a fighting chance. HOPE is what you need to have when the rumors send you home in tears. HOPE is what you need when you start to believe them. Your job is hard! It keeps getting harder and more complicated as we expand our world. Dont let it distract you from the most important thing you will teach your children. Kindness & self awareness. Raise kind people. Let them see you treat people well, not only because it’s descent, but it may just save a persons life. Help them become self aware of who they really are and what makes them bulletproof. The sooner they find their vision in life, the stronger their infrastructure will be to sustain the beatings they will get in high school & throughout the rest of their life. They may have 13 reasons to end their life, however if they find the 1 reason to live, that’s all they will need. You are not the things people say about you to bring you down! You are not the horrible things those boys did to you. You may be broken and your soul may feel lost but I promise you, you are a masterpiece! This may be your story, but it does not have to be your ending. Don’t write your book based on other people’s manuscripts. It’s not to late to cut your strings, and take back your fate. God loves you and the ultimate healer of your pain is Jesus. He is close to your broken heart and that is why you are reading this now. He wants you to know that you are not forgotten. He holds every tear you shed. He sees every unspeakable thing you go through, & cries with you! You are never alone. As far as the show goes, the 2nd season will reveal more haunting discoveries and will surely be another hit sensation. Always remember at the end of the day it’s a TV show. The cliffhangers and drama are here for our entertainment and we shouldn’t take it to seriously! However the overall message shouldn’t be discounted as just high school drama. Please Call now if you feel like you can’t ask anybody for help. Having a passion for the outdoors is a blast! Some people like a hint of adventure, some like A LOT OF ADVENTURE. Whether you are an extreme, all in adventurer or once a year kinda person you can purchase a few items today that will make you more prepared tomorrow. You can purchase as your budget allows or as you need them. The goal is to not go broke but instead get excited about trying new things! The Intex Challenger is an all in one kayak that comes with your paddle, pump and repair kit. This is perfect for day trips and is super convenient with easy storage. You can get a single or double kayak that holds 220lbs to 400lbs! Fun for the whole family and a great affordable option for anybody on a tight budget or just looking for a space saver! Having a way to get on a safe body of water and go wherever the stream takes you is a very cool feeling. Click Here to gets yours today! The Makino 60L backpack is the perfect bag for all your adventure needs. 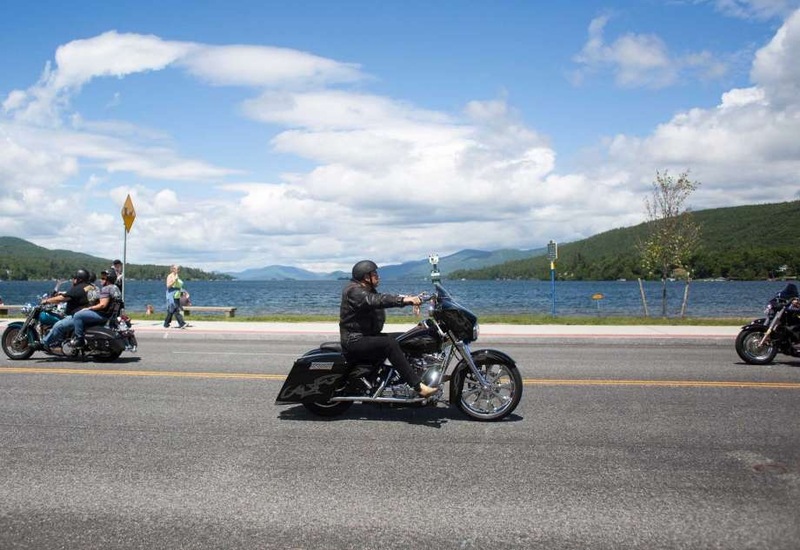 It will fit your needs on a day trip or even your most challenging overnight excursions. It comes with a rain cover to protect your gear and even contains technology compartments that will fit laptops and cell phones. Getting a good backpack makes any adventure more convenient, but make sure it’s the right fit for your style of adventure. Sometimes it takes a couple of uses to decide if its the right one for you. Don’t be afraid to shop around and always keep in mind that more expensive doesn’t always mean BETTER. You can always find a good backpack for less than $100. Check out this sweet deal on Amazon! This is an item you need to be a little more picky on and may need to pay more than $100 on! You can purchase items at Gear Trade for gently used equipment that is high quality at a low price. Good shoes can make or break any adventure. Crappy shoes = crappy experience. I recommend getting waterproof , ankle support shoes. This is really important for your long-term health because hiking and walking is good for you but if you have the wrong footwear it can cause long term joint pain and issues. Make sure you have good shoes. You can even go to places like fleet feet or a Podiatrist to ensure your shoes are the right fit for you! This makes any overnight camping trip a breeze. With all your utensils and carrying case, you’re sure to have everything you need to cook a descent meal. You can easily go to Wal-mart or Target and pick up different items for under $100 and make your own compact kitchen. I wasn’t that crafty and didn’t have the time, so I went online to purchase one the was already put together for me and it works! Click Here for a 13 piece set weighing under 2 pounds! One of the greatest aspects of adventure is hunting! Going out into nature and hunting prey to feed you and your family is one of the most adventurous things you can do! Although guns and ammo can get pricey, Fishing is an inexpensive way to explore hunting for food. It’s also a great way to introduce this idea to kiddos. With parental supervision you can show kids how to put bait on a hook, cast a line, and reel in dinner! It’s empowering for anybody to catch a fish, but its even more empowering for children to. You can go to any local Wal-Mart for basic items, & shop at Bass Pro, Cabela’s, & Gander Mountain for specialty items. It doesn’t take much to get started! I know it sounds so silly, but when you start to read, you start to dream. Reading awakens the soul and mind to new possibilities. That is why I am so passionate about writing this Blog! I truly believe if more people read about how to achieve their goals they would do it. 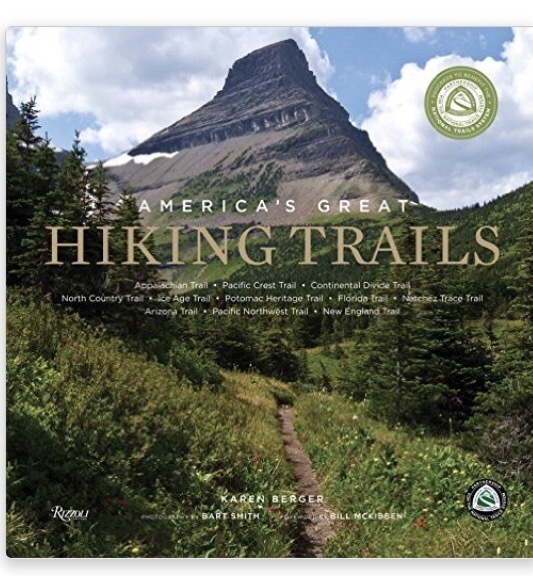 Reading books about hiking trails, camping spots, outdoor how to guides, etc. will inspire you to go out and do more adventurous things. Read to be inspired and don’t be afraid to plan your next big adventure! Here is a great gift idea or coffee table book to keep handy if you’re in need of some inspiration or a conversation piece! When you get tired of the same Ole, same ole, go out and try something new. You can always build on your equipment overtime, however these 7 items are what I have discovered to help me go out more! My personal favorite & the most fun is our kayak. 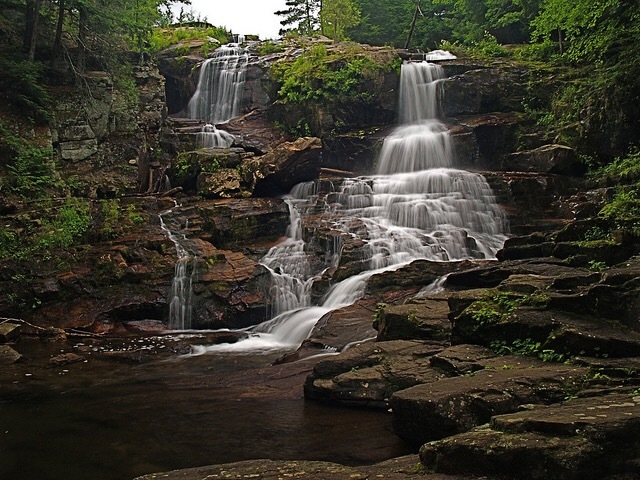 We can spend hours at the river or fishing coves just letting time move a little slower. Letting the stream take us wherever it leads it’s a perfect example of letting go of the things that don’t matter and enjoying the journey. Oklahoma has hidden surprises EVERYWHERE! Just north of Owasso (about 15 Minutes from Tulsa) there is Lake Oologah. 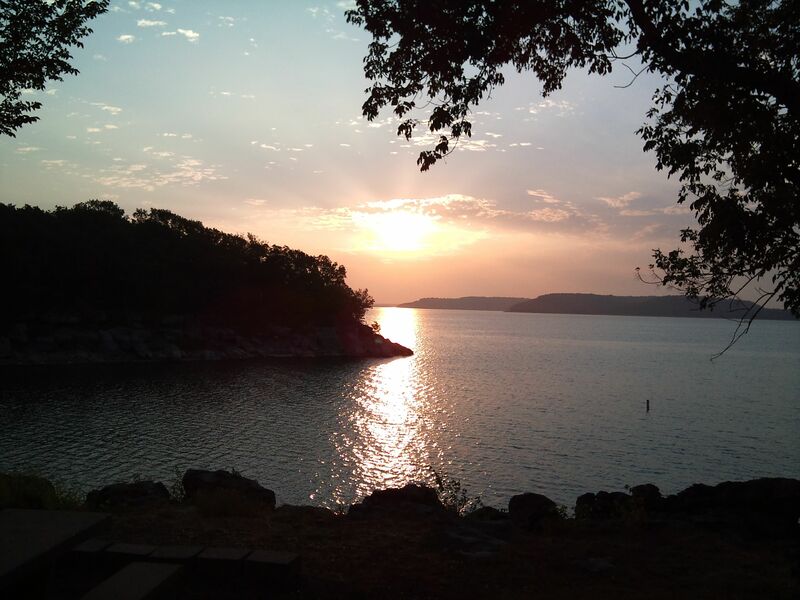 With 29,500 acres of water, 209 mile long shoreline, 11 lake side parks, and 18 amazing Hiking trails, Lake Oologah has a little something for everybody! 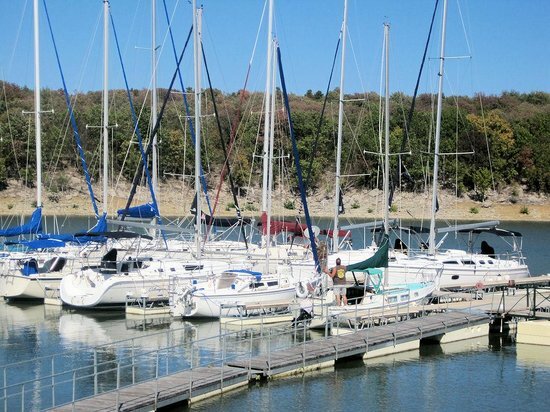 With deep waters and perfect wind conditions, Lake Oologah offers sailboat classes and rentals that people from all over the region travel to learn from! With all of these awesome amenities to choose from, there is one that doesn’t get the attention it deserves. Located at the far southwest corner of the lake contains Kayakers Paradise. Its known as Hawthorne Bluff just west of the Dam. Among locals this is a popular fishing spot, however the mile long loop secluded between two rock bluffs is a dream for kayakers! With 6-8 foot cliffs surrounding you there is no wind, plenty of shade spots and at the end of the cove is a fun spot to eat your lunch, jump off the cliffs, and go exploring. It does have a natural flow to the cove, but you will get a slight workout paddling to your destination! With its peaceful serenity you will leave feeling refreshed and relaxed. 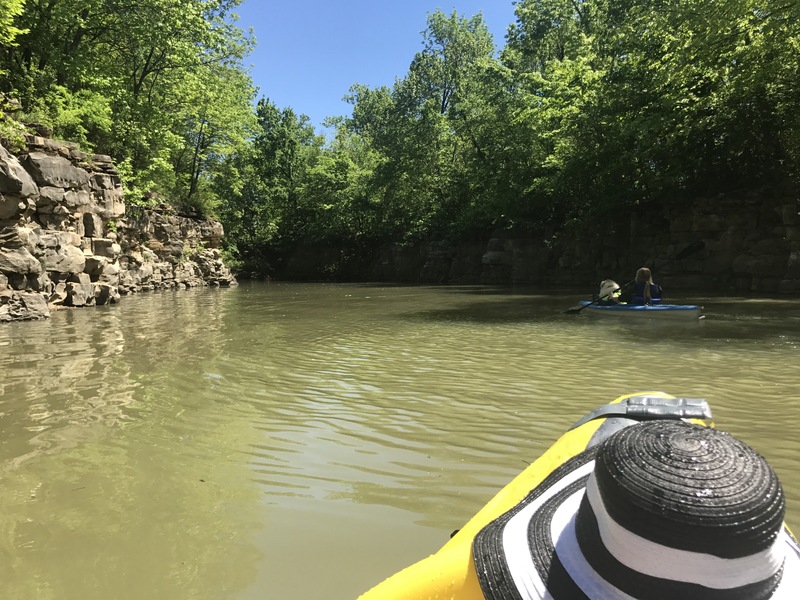 For kayaking close to home or traveling from afar, Hawthorne Bluff will NOT disappoint. 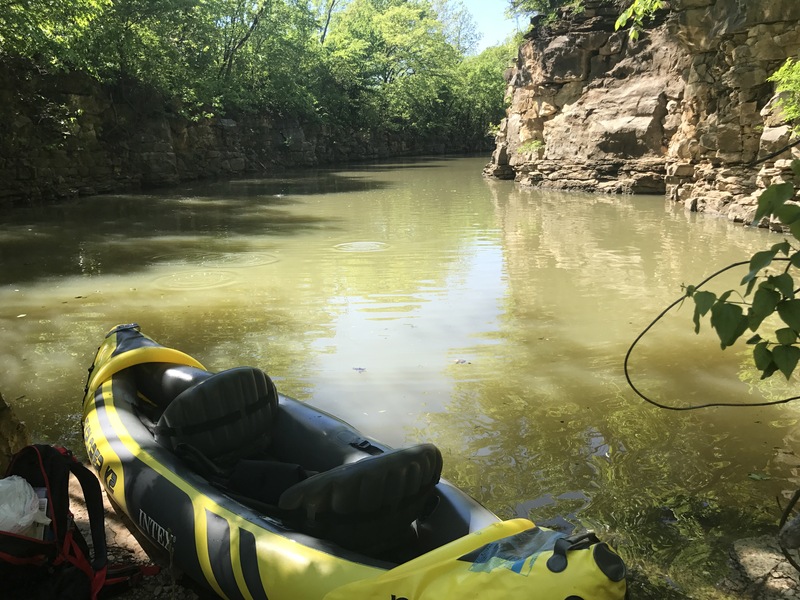 Bring all your paddling gear and if you don’t have access to paddles or kayaks, Redbud Marina does have all your water gear available to rent! This is truly a special place for Oklahoma. Just pay $5 for parking and get access to a beach, Frisbee golf, boat docks, fishing docks, restrooms, and some fun parks for the whole family! 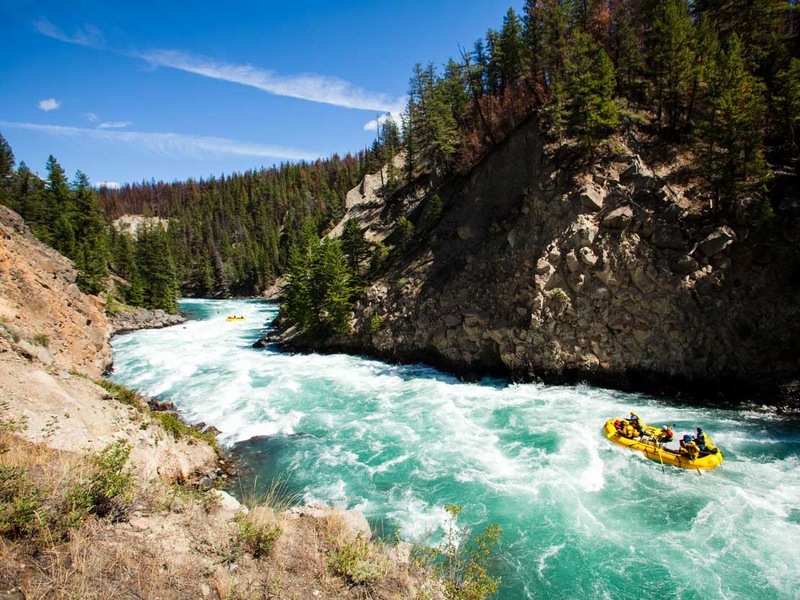 Click Here to get to kayakers paradise! I have never been a fan of gyms. The only gym I have ever been addicted to was the one I couldn’t afford because it was more like a country club. You know the gyms, the ones that have the incredible locker rooms, child care and showers. The plush towels, saunas, and hot tubs. The gym that has the Olympic size swimming pools with amazing spas and cafes, yeah those gyms. I wasn’t going for the exercise, I was going for the atmosphere! Even though all of that was amazing, it still at the core was a gym. Gyms historically are not beneficial but they get your monthly dues every time. They know it because they study this. They know how to make a fortune off you not even coming…. lol. Exercising outside is way more beneficial and less expensive! Exercising outside allows your terrain to constantly be changing, increasing the difficult in your workouts resulting in more calories burned! Wind gusts can cause great resistance while walking, jogging, or hiking causing your muscles to contract more with your exercise. The sun not only provides vitamin d while working out, but it also helps burn more calories by causing the skin temperature to heat up. This allows your body to burn calories for longer periods of time even after your workout is done! Outdoor workouts allow your mind to workout as well. Being outside increases mental clarity which allows your muscles to work for longer periods at time. So while you can be jogging for 15 minutes at a gym, you can double it easily by just going outside! It’s easy on the pocket book! You can do an amazing full body workout with no equipment. Just doing simple things like push-ups, burpees, lunges, squats, and planks are amazing exercises that can help you stay in shape. We have built a small garage gym over the course of a year. My husband found a weight set with barbells and bench at a garage sale for $125. We purchased the Schwinn Exercise bike for less than $800 on amazon, have purchased some clearance kettle bells & bought a variety of inexpensive resistance bands. With all of that we have started working out together by doing 20 minutes every evening in our garage! It’s a small step in a life changing habit. This way we can be outside as a family and while Caidon and ADDA play in the front yard, Brandon & I can use our garage gym that include all of the benefits of exercising outside. If you don’t have the time or resources for a garage gym, there are some amazing fitness programs around the globe that take this concept outside. In Tulsa, the number 1 outdoor fitness program is BOOTCAMP TULSA! It has 6 area locations including Owasso, Broken Arrow, and jenks. Founded by nationally recognized conditioning coach Jonathan Conneely, Bootcamp Tulsa takes fitness to a whole new level! All boot camps are held outside(weather permitting), with 1-2 coaches per location motivating you to do your best! Men and women are seeing dramatic results even after being stuck in a gym for years! Studies have shown that working out in groups creates better results, so if you cant find an accountability partner to workout with you, Bootcamp Tulsa is the perfect combination of outside exercise with accountability. For more information got to Boot camp Tulsa’s website. Always keep in mind that it doesn’t take a lot of change to make a BIG DIFFERENCE . It just takes small steps one day at a time. You can start by taking walks outside, involve your kids, let them see you active and enjoying nature. Build on that and expand your exercise on that small step and you will be AMAZED at how different your physical health will look like in a couple of short months. Go have some fun!